As some of you may know, one of my goals as a freelance graphic designer is to take advantage of my flexibility and spend time working abroad while taking extended trips. It's a learning experience (read more about my successes and failures working while "on vacation" in a previous blog post here) but I have to say I'm enjoying the journey! The best part; getting away for more than the standard 2 weeks of allotted vacation time. This is my second year jetting off for a full month, this time travelling around the Iberian Peninsula. 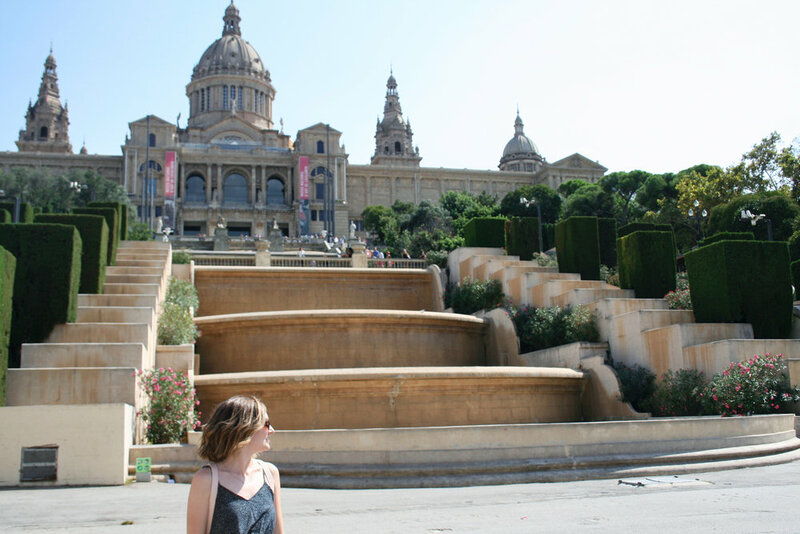 I began my travels in Barcelona, alongside 3 of my lovely friends. I decided to take 2 full weeks of vacation to start off my trip, no clients, no emails...freelancers need a vacation too and sometimes it's hard to enforce! Being in a different time zone with limited access to wifi helps. Barcelona was amazing. We stayed right in the heart of the city in a small Airbnb located in the Gothic Quarter. I highly recommend staying in this area. We could walk most places and had easy access to transit when needed. The Gothic Quarter had so many great shops, restaurants and bars, each day we discovered something new exploring the tiny winding (and confusing) streets. We stayed in the city for 6 days, which was a perfect amount of time to fit in everything on our itinerary without having to rush through it. On our third day in town we decided to head to Montserrat. 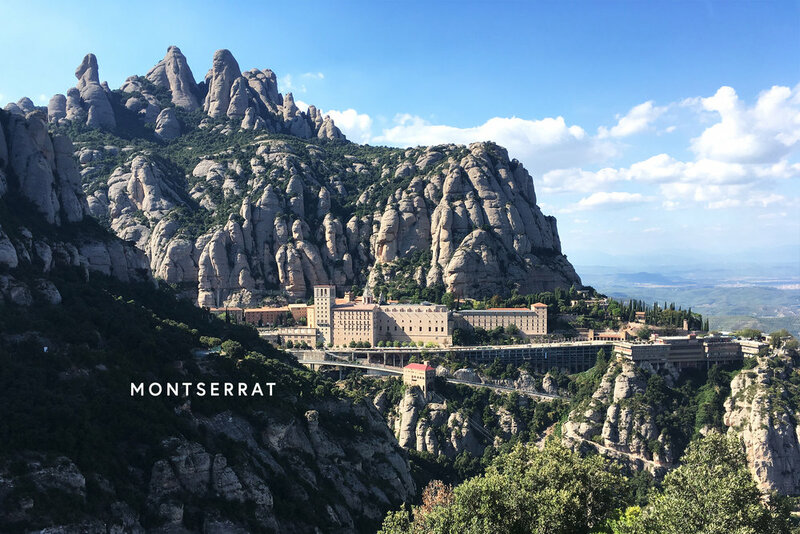 Less than an hour train ride from the city, followed by a slightly dizzying funicular, Montserrat is a breathtaking Benedictine monastery perched on a mountainside. It is exactly what it sounds like, picturesque and quaint! This day trip opened my eyes to how great it is to travel during the month of September! The weather is beautiful and the top tourist spots are not too crowded! We were worried Montserrat would be crawling with tourists but honestly, we had so much space to ourselves to pose for silly pictures, enjoyed a short hike to take in the view in peace, and had space to sit down for a picnic lunch. (Hot tip: there are only a few places to eat in Montserrat so bring items for your own picnic if you want to save $$. The little convenience store they have in town does not have a lot of variety, but it does have wine). Back to Barcelona for the remainder of our time and most of it was, you guessed it, Gaudi. 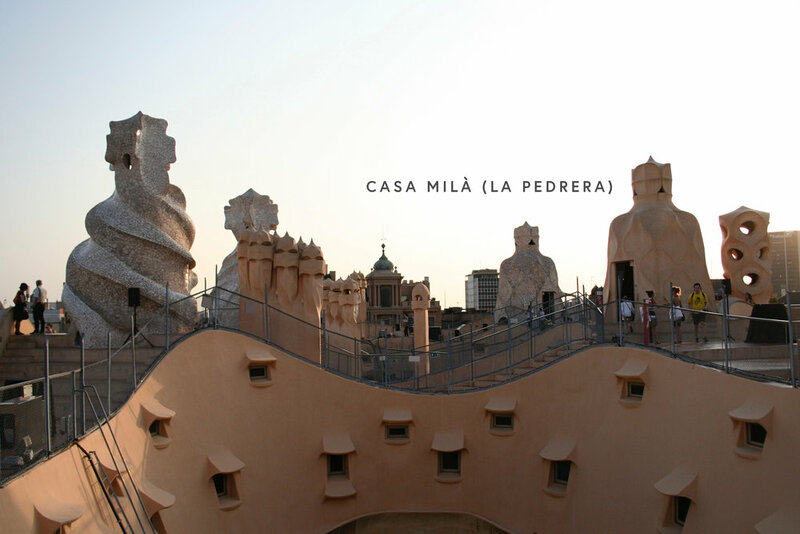 The architecture in Barcelona is a combination of many styles but the most influential and visibly stunning are the creations of Antoni Gaudi. After studying all of these famous works in Art History, seeing them in person was more than satisfying. You may think the Sagrada Familia is over-populated by tourists and not worth the visit because it's yet to be completed, but you would be wrong. The outside is so massive and overwhelming I think I spent 40 minutes just admiring all of the detail. The interior is filled with beautiful orange and red light coming through the stained glass windows in the afternoon. The high columns of the cathedral and the organic interior shapes combined with the beautiful light make you feel like you are in a magical forest. Trust me, it's worth the visit. Park Güell was also a beautiful experience. It's amazing to get to see the intricate mosaic up close as it covers every surface and it's different everywhere you turn. I personally love the organic and natural shapes that Gaudi incorporated into his work. It blends so well with nature and it unique unto itself. Hit me up for specific recommendations if you're planning a trip soon. We found some great restaurants and local spots I'd be happy to pass along, there are too many to list! We travelled to Sitges as two of my travel companions were attending a wedding there on the weekend so we gladly tagged along. A quaint beach town only 45 minutes from Barcelona, you don't feel like you're in a suburb of the city at all. Sitges was a beautiful place to spend the weekend (even though 1 of our 2 days there was stormy), we still spent a full day at the beach, enjoyed delicious vegan food at my new fav Indian restaurant (check out Spice Garden on your next visit) and relaxed in the guest cabin we rented for the weekend. After a long day of travel that is. 4:30am ride to the airport thanks to our accommodating Sitges hosts, 7am flight to Lisbon, 1 hour time jump forward, metro to train station, followed by 2 trains to Lagos and a 30 minute walk to our beach hostel, arriving at 3pm. BUT it was sooo worth it! Lagos is in the South of Portugal, along the Atlantic coast. the beaches are beautiful and the ocean is ready to surf. We didn't have time to arrange a surf day (and apparently it was actually too windy for newbies like us anyway) but we did go on a kayak excursion which was one of the best days of the entire trip. We kayaked through grottos and caves, saw the beautiful coastal rock formations and got to stop on a private beach to relax, swim and snorkel a bit before getting towed back to the main beach. Although the was pretty windy by the afternoon we had so much fun at the beach swimming in the huge waves. My fellow travellers had flights leaving Lisbon at the end of our second week away which is why we saved it for last. Lisbon was full of great architecture, a city filled with beautiful tiles (that help keep the apartments cool on hot summer days) lots of hills (which equal great views), street art, street cars and pastel de nata (Portuguese egg tarts)! From Lisbon we took a day trip to Sintra. A 1 hour commuter train ride takes you to the fairytale town which houses a Moorish medieval castle and a colourful romanticist castle. The two couldn't be more different and visiting both in one day was quite the experience. 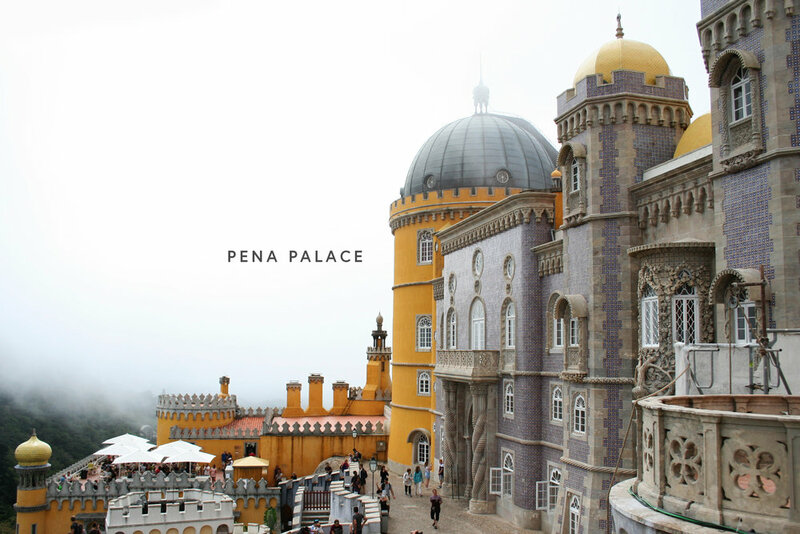 Not only were they such contrasts in style, but the weather did a complete 180 with cool fog rolling in when we started our day at Pena Palace, followed by bright sun and high winds greeting us at the Castle of the Moors later in the day. My friends said goodbye to me in Lisbon and I stayed in the city another few days because I hadn't seen enough! 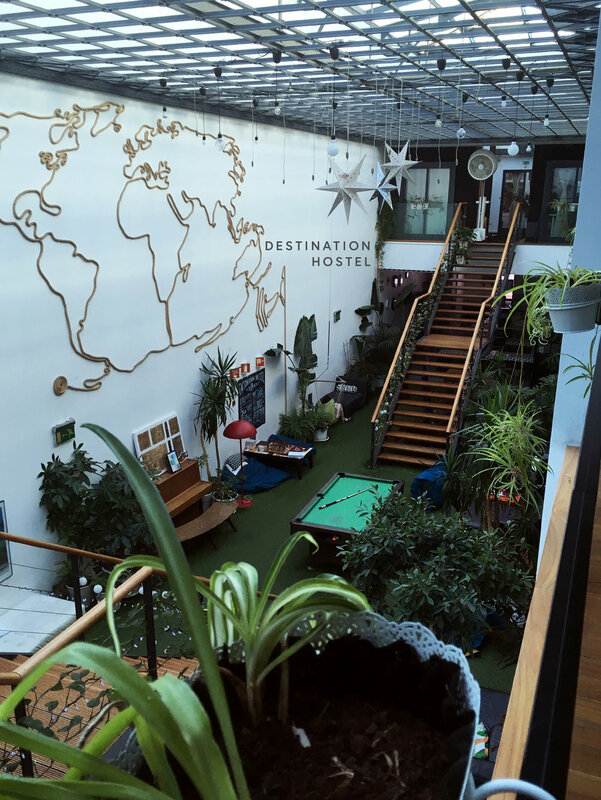 The hostel we stayed at, Destination Lisbon, was great for solo and group travellers and I honestly didn't want to leave. It was so clean, well designed and I really made me feel at home there. On my final days in the city I explored new neighbourhoods, took the street car to Belém to visit the Berardo Museum and taste the world famous Pastéis de Belém. 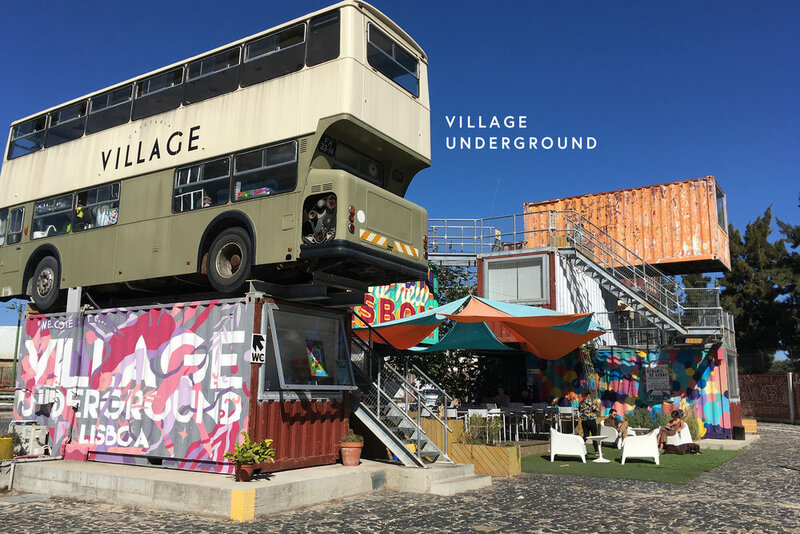 I also made the trek to the Village Underground, a community and coworking space made out of shipping containers and double decker buses turned shops, offices and restaurants! It was quiet on a Sunday, perfect for a delicious afternoon snack in the double decker bus cafe. After my friends left, my headpsace shifted from vacation to working abroad and after weeks of travelling, exploring and meeting new people, I needed some quality time to myself. 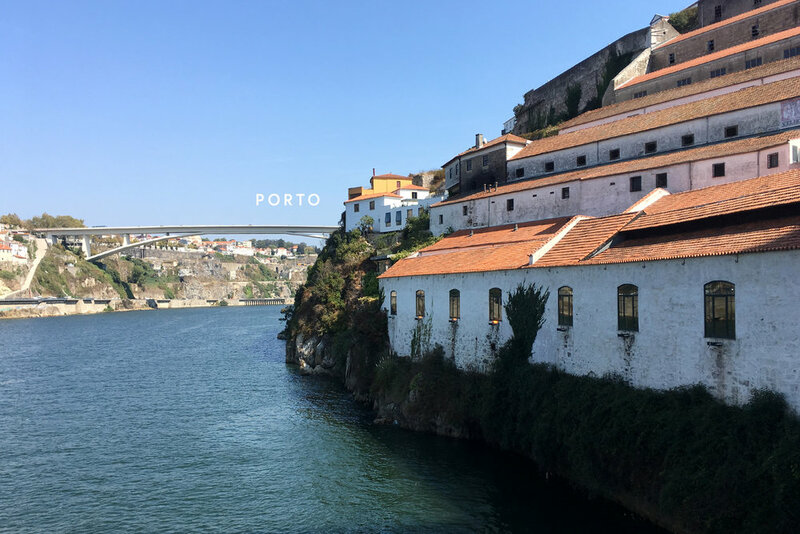 I booked a room in a cute airbnb apartment in Porto and went there for 3 nights to get some work done while exploring a new region of Portugal. Porto was charming! I loved being there by myself and trying their unique traditional foods that you can't get anywhere else in the country (see: Francesinha). From Porto I also took a day trip to Coimbra, a town about 1 hour away that is home to one of the oldest University's in Europe. It is one of the places where J.K. Rowling got inspiration for Hogwarts, as the students in the University where long black capes like the students in the Harry Potter books, so yeah, that's the main reason I went. After enjoying some more quiet time in Northern Portugal I went back to Spain, this time to Madrid to spend the last week of my travels there. Again I booked a longer stay in Madrid (7 days) so I was really able to enjoy my time. Madrid was such a fun city to live in, I say live because I didn't do many touristy activities. I walked through the city, made new friends at the hostel I was staying at, enjoyed good food, visited museums and ate churros. It's not a city with a lot of specific things to see so I got to spend time there just living and working and hanging out, which was so enjoyable and I loved my time in Madrid more than I anticipated. 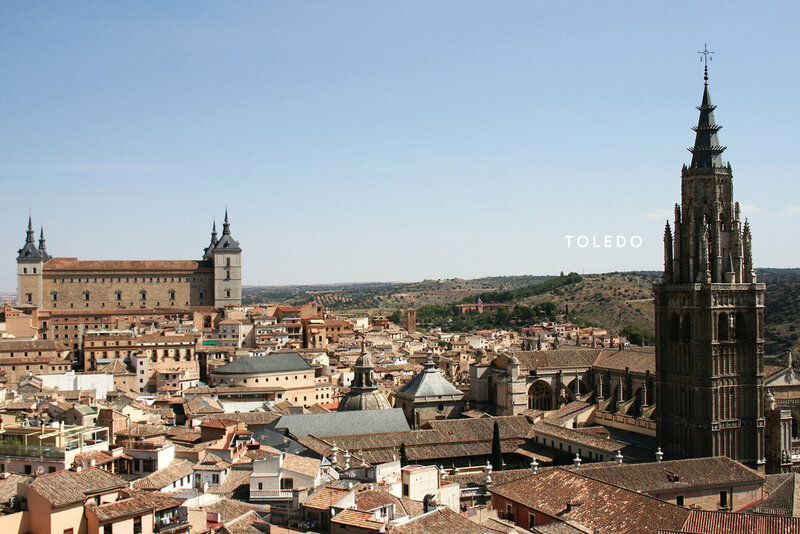 I did take one day trip from Madrid to the nearby city of Toledo, the previous capital city of Spain. Toledo has a lot of history and you can tell. The walled city is barricaded from years of war, there are cathedrals, mosques and synagogues built throughout a history of different occupying civilizations, as well as accompanying architecture. It was a beautiful, unique place to spend the day. One of my favourite activities I did while in Madrid was visit El Retiro park, a beautiful huge space perfect for reading a book and relaxing or renting a row boat to take out on the pond. Next to the park was the Prado Museum, which is free every night from 6-8pm. I waited for an hour in advance to make sure I got into the museum before 6:30 in order to have the most possible time to explore the huge collection of art at this museum. Some of the most famous Spanish and European works that I studied in school are kept here and it really was amazing to see them in person. I guess I'm a bit of a nerd in that way. I have yet to see the Mona Lisa at the Louvre, so I haven't been underwhelemed by any of the works of art I've had the chance to experience in person. After I said so long to Madrid I was on the last leg of my trip, London! This is the fourth time I've been to London and luckily a few of my Canadian friends reside there (and are nice enough to let me stay with them) in this expensive city! I always love spending time in London, visiting the free museums (Tate Modern for life) and exploring new neighbourhoods. My lovely host lived in a different neighbourhood than any I been to before so I got to explore a bit of Brixton on this trip. I spent time in lovely coworking spaces, shopped at some of my favourite European stores that we don't have here in Canada (yet) and my friend and I went to a play at Shakespeare's Globe which was amazing! Standing room tickets were only £5 and the show was so well done it was definitely worth standing for 2 hours. Go! As I continue to build my freelance business and learn how to manage my time (and budget) I'm hoping I'll be able to continue to take advantage of long travels and have the flexibility to work remotely! Let's see where next year will take me, I have a lot of destinations on the list and can't wait to check a few more off. Newer PostWhat is a Brand Refresh & How Can it Help Your Business?